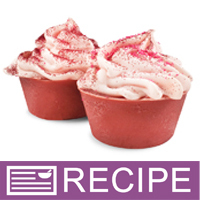 These adorable rose colored mini cupcakes look good enough to eat! This project and these instructions have been written for someone who has experience making soap and knows the potential dangers due to working with sodium hydroxide. It wil not outline safety methods of working with dangerous chemicals, it is simply a soap recipe for advanced soapmakers. In separate containers, measure by weight your water and your Lye. Gradually mix the Lye in water until the Lye Flakes are dissolved. Set aside in a safe place and allow to cool. Measure your Coconut Oil, Palm Oil, Olive Oil, Castor Oil and Mango Butter. This will be the bowl you will stick blend in, so make sure it will be large enough. In two separate containers masure 3 scoops, 0.15 ml. (Micro Size) of Matte Americana Red powder in one container and Neon Tutti Frutti dye in another and set aside. When both your oils and your lye water are about 125°F or below, you are ready to mix. With all of your safety equipment on (safety glasses, gloves, sleeves) and stick blender ready, pour your lye water into the oils. We recommend pouring down the shaft of the stick blender to try to avoid air bubbles. You are now ready to blend the soap. We stick blended until the soap reached a light trace, and then added our Fragrance Oil. Stir oils in by hand. Pour a small amount of soap batter in each container with pre-measured color. Blend the container with Matte Americana Red powder in it. Mix by hand, and then briefly stick blend. Once the color is blended, pour in about half of your remaining uncolored soap batter and blend. Pour into Petite Muffin Silicone Mold. Blend the container with Neon Tutti Frutti Dye in it. Mix by hand and then briefly stick blend. Once the color is blended, pour back into the remaining half of your uncolored soap batter and blend. Allow to come to a thick trace. This will be used for your frosting so it needs to be able to hold its shape. Once it has reached this consistency, load into your frosting gun or pastry bag and top the cupcakes. Top with glitter and/or jojoba beads and allow to set up. After at least 24 hours, when soap is firm, you can unmold the cupcakes. Allow to cure for 4-6 weeks before using. Check the PH to be sure it is at a skin-safe level. "What is the recommended retail price for each bar?" Staff Answer We have found that retail pricing can vary greatly depending on the market, location and average pricing for your similar products. Therefore we feel that it is more beneficial for our customer to set their own retail pricing. I would recommend an internet search for similar products to get a base price. Your retail price should be based on your purchase cost, labor cost, current market pricing and client base. Or you could use this formula: Supply cost x 4 = Retail.